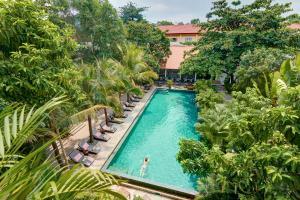 Located in the Daun Penh district, Saravoan Royal Palace offers accommodations in the heart of Phnom Penh. Guests can enjoy beverages at the in-house bar. Free WiFi is available throughout the property. It is 350 metres to the National Museum and 500 metres to Wat Ounalom. The Royal Palace is 950 metres away, while Central Market is 1.2 km from the property. The nearest airport is Phnom Penh International Airport, 10.1 km from the property. Airport transfers and shuttle services are available at an additional charge. All rooms are equipped with a TV with satellite channels. Some units include a seating area for your convenience. You will find an kettle with tea/coffee facilities and bottled water in the room. All rooms include a private bathroom equipped with a bathtub or shower. For your comfort, you will find bath robes, slippers and free toiletries. Guests can approach the 24-hour front desk for ticketing services and tour arrangements. When would you like to stay at Saravoan Royal Palace ? This spacious air-conditioned king suite features a private balcony that opens up to views of the courtyard. The seating area is fitted with a satellite TV, minibar and a desk. The en suite bathroom includes a bathtub, hairdryer and free toiletries. An electric kettle with complimentary tea/coffee facilities and bottled water are provided. This air-conditioned family room has a seating area fitted with a satellite TV, minibar and a desk. The en suite bathroom includes a bathtub, hairdryer and free toiletries. An electric kettle with complimentary tea/coffee facilities and bottled water are provided. This air-conditioned twin room is fitted with a satellite TV, minibar and a desk. The en suite bathroom includes a bathtub, hairdryer and free toiletries. An electric kettle with complimentary tea/coffee facilities and bottled water are provided. This air-conditioned double room is fitted with a satellite TV, minibar and a sofa. The en suite bathroom includes a bathtub or a shower, hairdryer and free toiletries. An electric kettle with complimentary tea/coffee facilities and bottled water are provided. Guests are required to show a photo identification and credit card upon check-in. Please note that all Special Requests are subject to availability and additional charges may apply. Please inform Saravoan Royal Palace in advance of your expected arrival time. You can use the Special Requests box when booking, or contact the property directly with the contact details provided in your confirmation. Each day we'll check prices and send you an email for your selected dates at Saravoan Royal Palace. If you don't have specific dates but would like to check prices for say next weekend or say next month we can check the price too. Click to write a review and share your experience of Saravoan Royal Palace with other travellers.